"This includes the ability to uniformly orient and reverse orient the ferroelectric domains with an electric field, despite the fact that the crystal is strongly confined by the surrounding glass," says Volkmar Dierolf, Chair of Lehigh University's Department of Physics and one of the scientists who worked on the experiments that resulted in these findings. Dierolf, who holds a joint appointment with Lehigh's Department of Materials Science and Engineering part of the P.C. Rossin College of Engineering and Applied Science, is co-Principal Investigator on a National Science Foundation (NSF)-funded project, Crystal in Glass, along with Principal Investigator Himanshu Jain, Diamond Distinguished Chair of Lehigh's Department of Materials Science and Engineering. The group has become a world leader in producing single crystals in glass by localized laser irradiation. 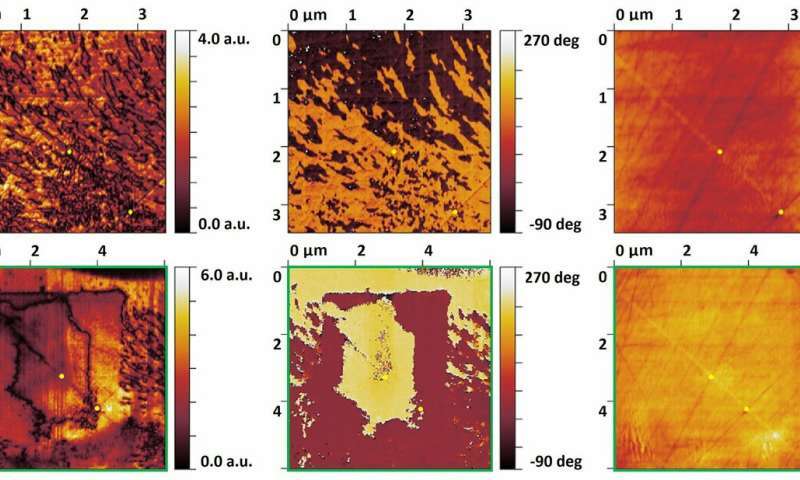 The team conducted the first detailed examination of the piezoelectric and ferroelectric properties of laser induced crystals confined in glass. They found that the as-grown crystals possess a complex ferroelectric domain structure that can be manipulated via the application of a DC bias. The findings will be published in a forthcoming issue of MRS Communications in a paper called "Ferroelectric domain engineering of lithium niobate single crystal confined in glass." "The findings open up the possibility of a new collection of optical devices that use fully functional laser-fabricated crystals in glass which rely on the precise control of the ferroelectric domain structure of the crystal," said Keith Veenhuizen, currently Assistant Professor, Department of Physics at Lebanon Valley College and the lead author of the paper, which builds on the work he did as a graduate student at Lehigh. Applications for such technology include use in modern fiber optic technology used for data transmission. "Being able to embed such functional single crystal architectures within a glass enables high efficiency coupling to existing glass fiber networks," says Dierolf. "Such low loss links?that maximize performance?are of particular importance for future quantum information transfer system that are projected to take over the current schemes for optical communication," adds Dierolf. Quantum Entangled Holographic Optical Data Storage Next ?